Thanks for all your generous info. I built this silicone version Fuzzrite using your layout and although it is a really good sounding square wave fuzz, I wasn't getting that synthy, compressed attack, Stephen Stills - Buffalo Springfield fuzz I was hoping for when I started this build. It comes pretty close at lower depth pot, higher volume pot settings but not quite there. 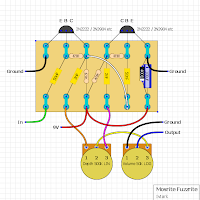 I added parallel resistors across the depth and vol pots, (1M and 100k respectively) to approximate the original pot values which worked well but doesn't have a big effect on the sound - but then I stumbled upon what might be the missing ingredient in this circuit and is missing from all schematics and layouts I've seen on the internet. Upon close examination of several original silicon Fuzzrite pics, it appears there is a 22k resistor between lug 1 of the depth pot and lug 3 of the volume pot. This lowers the gain drastically but adds that character to the sound that was missing before. It might not be for everyone as you really have to crank it to get unity gain and there isn't much boost available. Could be a cool option were it wired to a toggle or a second stomp which would give a huge boost when switched out. I could be missing something here. What do you think? Hi J and thanks for the info. 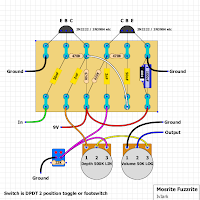 None of the schematics I found for the Fuzzrite included this resistor so I've just gone off the info I had, but it certainly sounds like a worthwhile addition, particularly as a switchable option. 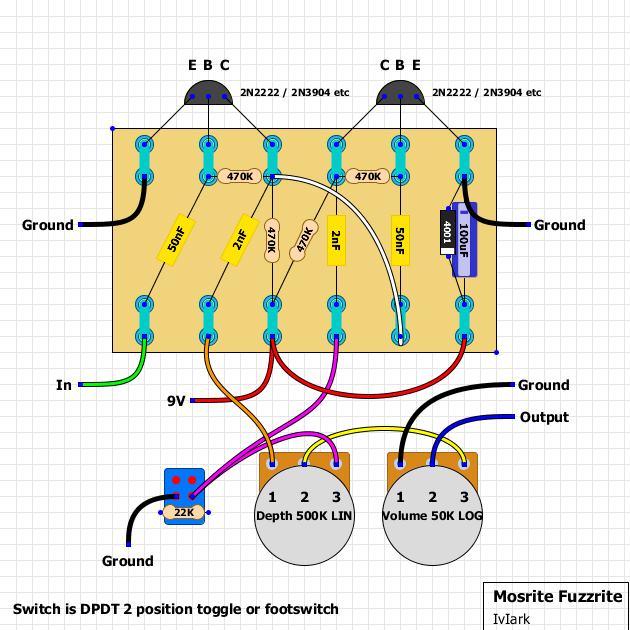 I've added a modded version to the post which uses a 2 position DPDT to switch the resistor in and out. I'll give this a try as soon as I get a chance. I did some more searching and I found a forum post where a guy mentions the necessity of the 22k resistor but I was mistaken about its placement as it is hard to see from the available photos. Apparently the resistor goes from lug 1 of the depth pot to lug 1(ground) of the vol pot. This makes all the difference! Now it doesn't lose so much volume and has that original character. So much for the boost switch idea! Although switching this resistor in and out might still be a useful option as it is still a higher gain pedal without it, just not quite true to the original sound. BTW I LOVE the tag board version you wired up! Being an amp guy, you gotta love the look of that! Very manly! hehe P.S. Where can you purchase tag boards like that? Gotta get some! Thanks for the info! That ampmaker.com site rules! That pic shows the resistor connected from lug 3 on the depth pot to ground. I'll alter the layout later. In terms of biasing it, the transistors get their supply via the two 470K resistors in the middle of the layout, going from 9V to the transistor collectors. So it may be worth trying swapping those resistors for a couple of 500K trimmers. I've heard people suggest that tweaking the resistor values isn't as crucial to getting the Fuzzrite sound as the transistor selection, and it's suggested that you go for something quite high gain for Q1 and quite low gain for Q2. So maybe it would be worth trying that first. I've heard conflicting info about the ideal transistor gains in Fuzzrite. On one forum some folks insist that q1 should be low gain and q2 high gain, the opposite of a Fuzz Face/Tone Bender type circuit. Guess we'll try both. The 22k properly connected gives a midrange character that is true to the original and not much overall volume change as opposed to where I had it before...in the wrong place! I experimented with different values and ended up with an spdt toggle switch to change between the stock 22k and a 220k which yields a nice fat low mid boost/shift. A very useful feature! Replaced the 470k bias resistors with a pair of 500k trims and arrived at 47k as my favorite value for each. Much better sound quality and range of fuzz than the stock value. Thanks for the info, guys! About the 22k resistor discussion, not truely clear for me yet!!!! (sorry) Is the properly connection from Depth (lug 3) to ground, or from Depth (lug 1) to ground? Depth pot lug 3 is correct Gabriel. Look at the two layout pictures at the top of the page, and you will see the difference. You want to use the second layout, with the 22k resistor on a switch. I have done this mod on all the Fuzzrites I have built - it really is worth it. Thanks, Beaker. I was missing that second layout! Helped a lot. Thought you might be interested to see a couple pics of my ptp turret board customized si FuzzRite style build which your tag-board build inspired. Additions are a Tone control(Garnet 18watt style) 22k/220k stock/fat switch and the mystery on/off switch which kicks this thing into awesome guitar synth territory that has blown everyone away who's heard it. I'll have to post some clips. Cheers! Excellent job J, I love it. And yes I'd be very interested in clips. what is the on off switch that makes guitar synth sounds? please post a final layout of your modded fuzzrite, i am interested to give this a try. hey guys, thanks a lot for this, I made the circuit on veroboard (after a stint on my solderless breadboard) and am very chuffed with the sound. at first it didnt sound right because I had the 2nd transistor the wrong way round! DOH! I'm pretty new to this. I have been attempting to make pedals for a year or so with little to no success however recently realised a lot of it was down to my soldering technique... anyway that's another story. This is the second circuit I have made successfully. first being an anderton TSF kit. anyway thanks again, just found this blog and the circuits on here are fantastic, Mastotron next :-) talking of which actually the diode I used in this is actually a 1n4148 (which is what it suggests in the mastotron circuit) I also used 2n3904 transistors. Excellent, glad you like it, and thanks for the info about the mods you did. Hi there, newbie signing in. I LOVE this pedal - I have had to build three so far as people keep asking me for one. As far as I am concerned, this is what fuzz is all about. Keep up the good work guys, it is much appreciated! I built this successfully, however there is an outrageous amount of high end noise. Any suggestion on how I could curb this nonsense? I'll start the new year with this fuzz today. I'm totally in love with this fuzz!!!! Looking for info on how to wire this pedal? Do all the grounds run to the input jack in a loop?